Canada's tax policy is in shambles and its fiscal condition is deteriorating. In the 2015 election campaign, the NDP leader, Thomas Mulcair, tried to debunk the tradition that New Democratic governments are extravagant and fiscally irresponsible and promised a balanced budget, albeit with some tax changes favouring lower-income earners. The Conservatives, under Stephen Harper, were steady on course, and the Liberals said they would run a short-term deficit to cover job-creating infrastructure investments. They also said they would lose $3 billion by cutting the second tax bracket, on incomes between $45,283 and $90,563, from 22 per cent to 20.5 per cent, and gain it all back entirely by increasing the top rate. The government had only been installed for a few weeks when the finance department ominously stated that this exchange would not be net revenue neutral. In fact, in 2016, the first entire year of the Liberal tax changes, the second bracket tax reduction appears to have lost $817 million and overall personal income tax revenues declined by $5 billion. We were promised that the deficits would end in three years and we would be in surplus by now. Pre-electoral fiscal promises almost never come to pass, but these were unusually wide of the mark, as Conservative spokespeople warned. The tax on high income earners did not produce the $3 billion promised. Instead that tax category, the much-abused one per cent (most of whom got there by hard work and constructive astuteness, and not as most politicians endlessly imply, by being sociophobic exploiters, greedy speculator, and tax cheats), generated $4.6 billion less in federal taxes in 2016 than in 2015 and about 90 per cent of the decline is claimed by finance ministry sources to come from Alberta. In 2016, more than 30,000 fewer Canadians were in the earlier highest tax bracket, which began at $140,000. It always seems to come as a merciless surprise to politicians on the left, even the soft left, that most people consider that they have earned their incomes, that it is theirs as much as their private property is, and that governments do not have an unlimited, unchallengeable or unaccountable right to gouge an individual's earned income. 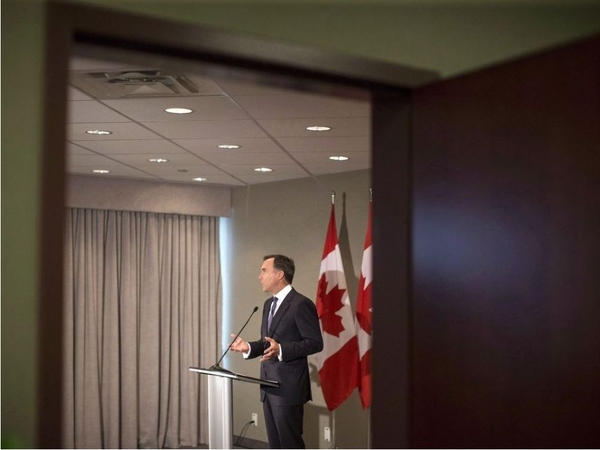 Authorized spokesmen for the Minister of Finance, Bill Morneau, have claimed that this is a once-only occurrence because people who had the option crowded as much as they could of their incomes into the pre-tax hike year of 2015, reducing 2016 revenues, and that they will bounce back in 2017. All agree that a substantial part of the problem is the heavy hit to Alberta incomes from the absurd oil price, partly influenced by the various pipeline fiascoes and partly by the sand-bag job conducted by British Columbia against Alberta' efforts to export oil via B.C. ports. It is painful to see Alberta in this straitjacket, tormented by its provincial neighbour, now governed by an antediluvian Green-NDP coalition, and tormented by the ineptitude, if not the malice, of the federal government. The judicial rejection of the Kinder Morgan pipeline, which the federal government paid $4.5 billion for, has put Alberta under intolerable pressure and requires Ottawa to find some way to get the pipeline built or be convicted by the voters of being completely ineffectual, incompetent and of squandering $4.5 billion while assisting the silly hobgoblins who now run the B.C. government in turning innocent and long-suffering Alberta on the spit. It is a stupefying mystery that anyone in Ottawa, elected or otherwise, who has anything to do with the tax system, does not realize the dangers of taxing at higher rates than prevail in the United States. We went through this with the Kennedy-Johnson tax cuts in the United States in 1965 and again with the Reagan tax cuts in the 1980s. The highest personal Canadian income tax rates are now almost 20 per cent above U.S. rates, where more exonerations and deductions are allowed than in Canada, and many of the more prosperous states such as Florida and Texas have no personal income taxes. Comparatively high tax rates invariably cause what are delicately called "behavioural changes," which means some departures of wealthy people from the country, more ingenious and strenuous tax avoidance measures, and possibly some outright evasion as well. The Trump tax cuts of 2017 have not really been reflected in published Canadian tax income reports yet, and the impact of the reduction of corporate tax rates from 35 per cent to 21 per cent in the U.S. last year could, as William Watson published in this newspaper on Tuesday, cost Canada $50 billion. The Trump tax cuts, which rival or possibly surpass the earlier Johnson and Reagan reductions, have, contrary to the gloomy predictions of the now rather mindless globalist media such as the Economist magazine, almost paid for themselves. This is the result of the counter-behavioural changes, as people spend and invest more when rates are reduced. It is not a zero-sum game, but the world only discovered that when the after-effects of the First World War and the Great Depression obliged all major countries to engage in deficit spending: devaluing the currency while increasing the money supply and spreading it to the recently dispossessed. John Maynard Keynes and the-then U.S Federal Reserve chairman, Marriner Eccles, argued for deficit-financing of recoveries and accumulation of surpluses in times of prosperity. In practice, the first, but little of the second, has been applied and the demonetization of gold has produced a relentless slide in the purchasing power of every currency. Canada has now chosen the worst of all possible options: higher taxes, substantial deficits and low growth, with a lot of belligerent talk about retreating from NAFTA to World Trade Organization tariffs. The HST remains unchanged. I have been incanting, almost until I am blue in the face, that we should cut all income taxes to below U.S rates and raise the HST on all voluntary spending. This effectively makes paying tax almost voluntary, and induces behavioural changes toward increased purchases of goods and services within the economy, increased savings, and less attention to the most ingenious methods of avoiding tax and moving assets and cash flows out of country. Seven of our ten provinces now have top tax rates above 50 per cent; this is state larceny and incompetence. Other than in an extreme national emergency, the state has no right to more than half of anyone's income. If the population elected to operate defined essential government services from a service co-operative administered by private-sector standards of efficiency, what are now public-sector costs would be reduced by probably half, the savings could be rebated to the public with the low-income earners favoured, and the whole world would send observers to see the Canadian economic miracle. It isn't going to happen because it is too radical and impossible to sell in advance or execute incrementally. But no government that has high taxes, low economic growth (they go together and are inseparable) and large deficits is going to succeed.